Herbs and Healers from the Ancient Mediterranean through the Medieval West brings together eleven papers by leading scholars in ancient and medieval medicine and pharmacy. 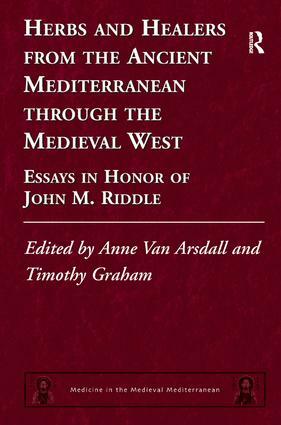 Fittingly, the volume honors Professor John M. Riddle, one of today's most respected medieval historians, whose career has been devoted to decoding the complexities of early medicine and pharmacy. "Herbs" in the title generally connotes drugs in ancient and medieval times; the essays here discuss interesting aspects of the challenges scholars face as they translate and interpret texts in several older languages. Some of the healers in the volume are named, such as Philotas of Amphissa, Gariopontus, and Constantine the African; many are anonymous and known only from their treatises on drugs and/or medicine. The volume's scope demonstrates the breadth of current research being undertaken in the field, examining both practical medical arts and medical theory from the ancient world into early modern times. It also includes a paper about a cutting-edge Internet-based system for ongoing academic collaboration. The essays in this volume reveal insightful research approaches and highlight new discoveries that will be of interest to the international academic community of classicists, medievalists, and early-modernists because of the scarcity of publications objectively evaluating long-lived traditions that have their origin in the world of the ancient Mediterranean. 'This volume is a festschrift for the eminent historian of medieval medicine John M. Riddle. It especially honors Riddle's innovative and pioneering studies of herbal medicine in the pre-modern West.' The Medieval Review '… the volume makes plain the profound impact Riddle has had on this discipline, and it is very successful as a celebration of that work… these essays will open up new corners of the territory for readers who already have some background in ancient or medieval pharmacy.' Bryn Mawr Classical Review 'The editors of this volume have included a bibliography of Riddle’s contributions from 1964 to 2010, in itself a handy resource, but it also allows one to monitor the trajectory of Riddle’s research interests over time, and see how chasing certain questions led from one field of enquiry to another, often boldly into unknown territory, highlighting Riddle’s pioneering role in the field of premodern pharmacy.' Bulletin of the History of Medicine 'The papers here act as both homage to and commentary on [Riddle’s] intellectual journey, moving chronologically from the eastern Mediterranean in antiquity towards medieval western Europe.' Medical History '… a clear demonstration of how valuable historical information can be, especially when critically evaluated, for a greater knowledge of medicinal plants.' HerbalGram 'The level of scholarship throughout the volume is extremely high. All authors display immense knowledge of their own field, and do not hesitate to convey it in a technical - yet clear - manner.' Social History of Medicine '… the collection’s unifying factor is the individual texts’ resonance with aspects of Riddle’s work, and as such it is wide-ranging, perhaps dauntingly so. But its breadth speaks to the flourishing of scholarship in the history of medicine, attested to by the appearance of new book series such as the one to which this volume belongs. Anne Van Arsdall is a research associate in the Institute for Medieval Studies at the University of New Mexico, USA and Timothy Graham is Professor and Director at the Institute for Medieval Studies, University of New Mexico, USA.